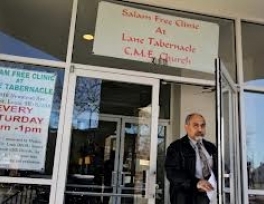 Seeking to help Americans falling the cracks of the health care system, Muslim doctors have opened a clinic at a church in the US county of St Louis to provide a free medical help for poor residents. The doctors “were not only interested in our own people,” Bahar Bastani, president of Dar-al-Zahra mosque and professor of internal medicine at St. Louis University, told St. Louis Post-Dispatch on Thursday, December 27. “We chose north city because there are so many people there who don’t have jobs and don’t have insurance". A group of Muslim doctors have proposed to establish a clinic to offer medical help to poor Americans. They approached Rev. James Morris, pastor of Lane Tabernacle Christian Methodist Episcopal Church in north St. Louis, to help them set up a free clinic on Saturdays. 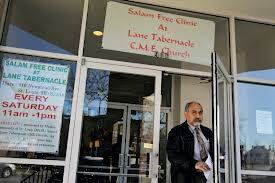 At first the Salam Free Clinic at the church was met with skepticism. “They kept asking, ‘What’s the catch?" Morris said. Every Saturday, a group of 14 Muslim physicians see patients for three to four hours to treat patients. All simple X-rays and routine labs – screens for heart, kidney, liver – are processed by St. Mary’s Health Center for free. Since the clinic started operation in 2008, hundreds of patients have been treated by the Muslim doctors. Muslim physicians say they are motivated by their faith to treat people free of charge. Bastani cites a number of sayings of Prophet Muhammad (peace and blessing be upon him) encouraging Muslims to serve their society. “The best of you is the one most serving the community,” he quoted one of the Prophet’s saying. This is not the first time Muslim doctors provide free medical help for patients. Last year, the Association of Physicians of Pakistani Descent of North America established a clinic providing free dental, ophthalmologic, pediatric and pain-management services on Sundays at the Balal Mosque on St. Louis University’s campus. Another clinic was opened by the Islamic Foundation of Greater St. Louis, in partnership with Volunteers in Medicine in October. “We are both children of Abraham, and when we pray together to start a meeting, I believe we are praying to the same God,” said the Rev. Mauri Peaco, pastor of St. Peter’s Church. “They are committed to making a more just and peaceful world, and so are we, so it’s a natural collaboration".